Picking the right college is not easy. This is true everywhere and Michigan, with more than 100 schools to choose from, is no exception. From large research universities to small liberal arts colleges, Michigan is home to a spectrum of higher education institutions. To find the right school, you'll need to weigh tuition costs, academic offerings, financial aid and many other factors. To help, we have applied our rigorous methodology to the latest education data to rank the best colleges in Michigan, including the top four-year and two-year schools. To provide the best list possible, we have accounted for all of the factors students value when choosing a college. Key measures incorporated in our algorithm include acceptance, retention, graduation and enrollment rates. We have also included each school's student loan default percentages, as we know how important it is for students to repay their debts upon graduation. The list below highlights the top two-year and four-year colleges in Michigan. Michigan's schools have a long history of providing an excellent education to students. The state's oldest institution, the University of Michigan, was founded before statehood, and many four-year colleges in Michigan are among the top-ranked schools in the nation. Graduates from a Michigan college can expect to earn a significantly higher salary than non-degree holders throughout their careers. Recent initiatives have increased public awareness and involvement in postsecondary education in Michigan. The Getting to Work program has produced plans and improvement suggestions for career counseling, college affordability, student debt and hands-on training. Considering Michigan's reputation as a bastion of education, these developments bode well for enrollees in the state's colleges. 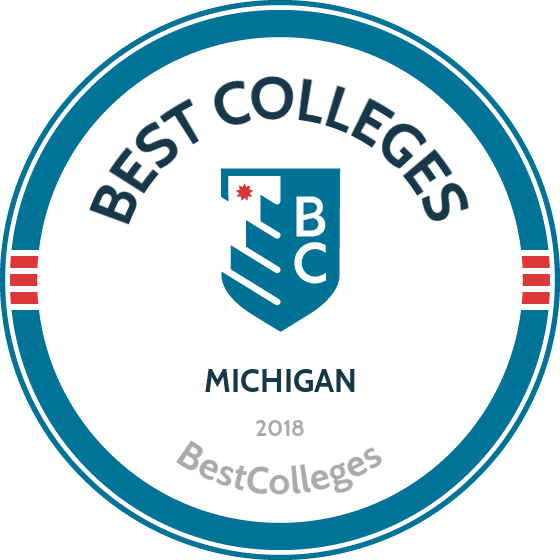 As you're researching the state's various four-year options, we invite you to pursue our ranking of Michigan's best colleges, presented below. Here you'll find a short profile for each school, including a brief rundown of their academic strengths and campus attractions. Founded in 1817 in Detroit, the UofM moved to the site of its current Ann Arbor flagship campus in 1837. The university’s extensive campus features 594 buildings and 16,000 trees spanning 13 million square feet. The school also includes two satellite campuses in Dearborn and Flint. UofM offers more than 250 majors and programs spanning 19 academic schools and colleges for undergraduates, as well as graduate and professional students. The university is among the best colleges in Michigan for its research-intensive programs in healthcare and medicine, though a broad range of majors in liberal arts and sciences are available. Of the more than 44,000 students on campus, over 79% participate in student clubs and organizations targeting sports and outdoor adventures, cultural exploration, and student leadership. The school is affordable, with two out of every three students receiving financial aid. Nearly 90% of students graduate within five years. Founded in 1855, Michigan State served as the prototype for other land-grant colleges in Michigan established under the Morrill Act of 1862. The university’s 5,200-acre campus in East Lansing provided the ideal setting for MSU to offer the nation’s first scientific agriculture program. The university was also the first in the U.S. to offer programs in nuclear physics, organizational psychology, and rehabilitation counseling. MSU offers more than 200 majors and programs spanning more than 15 degree-granting colleges with a focus in liberal arts, science, medicine, and engineering. Undergraduate, graduate, and professional programs are available. MSU’s campus residence halls comprise one of the nation’s largest single-campus housing systems, serving a student enrollment of more than 50,000. The university is home to a record number of national and international scholars; there are 43 Goldwater, 18 Churchill, and 17 Rhodes scholarship winners among the student body. Madonna University was established in 1937 by the Felician Sisters to provide liberal arts education in the Catholic and Franciscan traditions. The university has expanded to serve a student enrollment of more than 4,500 since graduating its first class of just 18 Sisters in its inaugural year. The university encompasses a main campus in Livonia, as well as additional outreach learning centers in southwest Detroit, Gaylord, and Macomb. The university offers dozens of majors and programs across six schools and colleges: Arts and Humanities, Education, Natural and Social Sciences, Nursing and Health, Business, and Graduate Studies. ESL and not-for-credit programs are also available, both on-campus and online. MU is the first and only among colleges in Michigan to host an independent gerontology department, as well as a national pioneer of sign language studies and hospice education programs. Established in 1885 as a public research university, Michigan Tech sits on 925 acres on the state’s Upper Peninsula, near the Keweenaw Waterway and Lake Superior. Variable weather conditions, including an annual average snowfall of 218 inches, are the ideal setting for the Michigan college’s focused majors in forestry and environmental science, natural and physical sciences, and engineering. In total, the university offers more than 120 programs for undergraduates and graduate students across seven schools and colleges. Online courses, accelerated professional programs, certificates, dual-degree options, and undecided majors are also available. Students on campus can participate in more than 220 campus activities, many of which promote outdoor adventures like viewing the Northern Lights, boat races on the Keweenaw Waterway, and a Winter Carnival. MTU is home to 14 varsity athletic sports, including the NCAA Division I men’s ice hockey team, as well as intramurals involving human ice bowling, broomball tournaments, and more. University of Michigan’s Dearborn location was founded in 1959 on a 200-acre plot of land, through a multi-million dollar endowment courtesy of Ford Motor Company. Since graduating its inaugural class of just 34 and initially offering only three programs in industrial engineering, mechanical engineering, and business administration, UMD has expanded to include more than 100 undergraduate and over 40 graduate degrees and programs. Academics span four distinct schools and colleges: Arts, Sciences, and Letters; Business; Education; Health and Human Services; and Engineering and Computer Science. The university also provides students with the opportunity to pursue more than 700 unique internships and co-ops each year. Of a total enrollment of 9,308, nearly half are first-generation college students. Today, UMD’s campus location is unique among Michigan colleges, mere miles from the world headquarters of its original benefactor, the Ford Motor Company, and encompassing more than 70 areas of official wildlife preservation on its grounds. Andrews was founded in 1874 by a teacher in the Seventh-Day Adventist tradition. The university has since evolved into one of the only Adventist colleges in Michigan, as well as one of the most renowned worldwide. Andrews’ 1,600-acre campus is located within the Oronoko Charter Township, near the village of Berrien Springs. The university offers roughly 130 undergraduate and 70 graduate programs across eight academic areas, including unique offerings in aviation, architecture and interior design, and Seventh-Day Adventist theological seminary training. Andrews operates off-site locations and extended learning centers in 19 countries and on five continents all over the world. The school has an enrollment of 3,366, but has made highly personalized programs a hallmark of its institution. The average student-to-teacher ratio is just 10:1. Andrews’ campus is home to its own ministry, numerous intercollegiate and intramural sports, and more. Founded by Baptists in 1833 as the Michigan and Huron Institute and later renamed for its namesake location, Kalamazoo College is not only one of oldest liberal arts colleges in Michigan, but also in the nation. Today, the university operates independently of its affiliates, though it remains historically linked to the traditions of the American Baptist Church. The school encompasses a 60-acre hilltop campus in close proximity to Detroit, Chicago, and Lake Michigan in Kalamazoo, as well as a 135-acre arboretum off campus. KU programs are developed according to the school’s signature “K-Plan,” which provides liberal arts and science education with a global focus through experiential learning and a senior individualized project requirement. The university offers dozens of majors, minors, and academic programs spanning seven schools and colleges, including Fine Arts, Natural Sciences and Mathematics, Modern and Classical Languages and Literature, and more. Over half of the more than 1,400 students on campus participate in service-learning projects; there are over 70 student organizations, ranging from cultural interests to environmental conservation initiatives, for students to enjoy on campus. Founded in 1876 in Grand Rapids as a seminary and junior college, Calvin College is affiliated with the Christian Reformed Church in North America (CRCNA) and Council of Christian Colleges and Universities (CCCU). Since its inception primarily as a ministry education and training facility, this Michigan college has expanded into a four-year degree-granting institution. Today, Calvin’s 400-acre campus serves an enrollment of nearly 4,000, 99% of whom are participants in the school’s many service-learning opportunities. The university offers more than 100 undergraduate programs across 10 schools and colleges focused in a range of interests, from business to fine arts to STEM research. Dozens of majors, minors, concentrations, and pre-professional programs are available. Top undergraduate majors include education, engineering, and business. Calvin also offers a master of education (MEd) and a master of speech pathology and audiology. Around 97% of first- and second-year students at Calvin live on campus; there are seven dorm buildings and more than 70 student organizations for those in residence. The school is home to 21 varsity athletics teams and more than 60 intramural sports on campus. 9 Northern Michigan University Marquette, MI Cost: $$$$$ Graduation Rate: 46% Northern Michigan University, located in Marquette, Michigan, is a dynamic four-year, public, comprehensive university that has grown its reputation based on its award-winning leadership programs, cutting-edge technology initiatives and nationally recognized academic programs. Situated along the shores of Lake Superior, NMU offers endless opportunities for exploration both inside and outside of the classroom. The university offers dozens of bachelor’s degrees in more than 180 majors spanning the liberal arts; the most popular majors are art and design, nursing, and education. Associate degrees, pre-professional programs, certificates, and enrichment programs are also available. NMU is home to roughly 300 student clubs and organizations on campus, with interests ranging from anime to paranormal investigation to a theatrical improv troupe. Founded in 1960, GVSU’s main campus sits on 1,322 acres in Allendale, MI. Nearby in Grand Rapids, the university operates the Robert C. Pew campus, and manages four additional campuses and regional learning centers throughout the state, serving a total student enrollment of 25,460. Since graduating its inaugural class of 226 students in 1963, GVSU has evolved into one of the best colleges in Michigan for exemplary liberal arts programs, with a focus in healthcare and medical sciences and education. The university offers more than 88 undergraduate degrees spanning hundreds of academic areas, from art to integrated science to writing majors. Students may also choose to explore interdisciplinary study as an undeclared major. Graduate and online programs are also available. Albion is a pioneer among environmentally responsible college campuses, offering nearly 200 sustainability courses within its curriculum, completing 20 LEED-certified building projects, and carrying out more than 250 energy-saving initiatives over the last 15 years. Central Michigan was established in Mount Pleasant in 1892 as a teacher training institution. A lucrative land acquisition within two years of its inception allowed CMU to construct permanent facilities where its Warriner Hall administration building still stands today. Campus facilities have expanded as enrollment has increased over the years; today, the school tops the list of the largest public colleges in Michigan and nationwide, serving nearly 27,000 students on a 480-acre campus. The university offers more than 200 academic programs spanning eight schools and colleges, with a focus in, but not limited to, business, education and medicine, and health professions. Standout bachelor’s degrees include majors in fine arts, music education, and social work. The school is the largest producer of teacher education alumni in the state; notable alumni in additional fields include an international ambassador of foreign nations, a former professional NBA player, and the senior VP of sponsorship and internal communications for AT&T. Founded in 1835 as a namesake of its geographical location, Albion College is a private four-year liberal arts college affiliated with the United Methodist Church. Albion was the first among colleges in Michigan to host a Phi Beta Kappa chapter on campus. In addition to encompassing 90 acres of education facilities and learning space, Albion’s campus includes a 144-acre nature center and a 340-acre equestrian center. The university offers more than 70 academic programs in a variety of majors, concentrations, and pre-professional tracks. Students may choose a double major in interdisciplinary studies across academic departments. Popular majors include biology/biological sciences, economics, and psychology. Of a total undergraduate enrollment of nearly 1,500, 90% of freshman live on campus. Albion features a comprehensive first-year orientation experience for new students, and more than 100 groups and organizations on campus that explore Greek life, religion, sports, diversity awareness, and more. OU’s Rochester campus spans over 1,400 acres of meadows and wooded hills, serving a student enrollment of more than 20,000. Comprised of three separate locations throughout Macomb County, OU encompasses more than 50 university buildings, more than eight residence halls, and over 109,000 square feet of research space. The school is also home to an art gallery, amphitheater, and athletic dome stadium. The university offers more than 250 academic programs for bachelor’s, master’s, and doctoral students. Professional certificate programs are also available. Programs span seven colleges: Arts and Sciences, Business, Education and Human Services, Engineering and Computer Science, Health Sciences, and Medicine and Nursing. The university is a leader in healthcare education among colleges in Michigan, affiliated with dozens of research centers operating throughout the state and with its own Human Health Building, opened in 2012 to serve the nursing and health sciences schools on campus. Classes maintain a low student-to-teacher ratio of 21:1, and 91% of faculty have doctoral degrees in their respective fields of study. Founded in 1862 in the tradition of the Reformed Church in America, Hope College encompasses an innovative urban campus in downtown Holland, MI. The college is known among Michigan colleges for its unique combination of history and modern technology; the campus houses both the historic Van Vleck Hall, built in 1857, and the school’s own Pelletron particle accelerator machine. Hope sits mere miles from Lake Michigan and only a few hours from Chicago’s major metropolitan area. Dozens of undergraduate programs are offered across three primary academic schools: Arts and Humanities, Natural and Applied Sciences, and Social Sciences. Psychology tops the list of popular majors. Hope is the only Michigan college, and one of few in the U.S., to offer the Baker Scholars Program, which provides hands-on experience in professional scenarios for business students. The school was the first private four-year liberal arts college in the country to receive accreditation in four liberal arts. Kettering was established in 1919 as the School of Automotive Trades by inventor and industrialist Charles Kettering. Through the years, while receiving funding from General Motors, the university expanded to become a degree-granting institution, develop cooperative learning opportunities, and offer on- and off-campus education and professional training. Today, Kettering is known among colleges in Michigan and throughout the country for its robust STEM and business programs. The university offers 14 undergraduate degrees in 12 academic departments, including renowned programs in mechanical engineering, biology, and computer science. Graduate degrees and three fully online programs are available online. Since 2010, Kettering has earned more research grants from the National Science Foundation than any other Michigan college during that time. The university is home to more than 45 student organizations on campus, including popular FIRST Robotics events; Kettering was the first in the nation to open its own Robotics Community Center on campus. Founded in 1939 as Reformed Bible Institute, what came to be known as Kuyper College originally offered three-year programs in service-oriented, Christ-centered higher education and ministry training. Kuyper was approved to confer four-year bachelor’s degrees in 1970, and soon began offering majors in social work, education, business, and more, alongside its original programs in pre-seminary, ministry, and cross-cultural service learning initiatives. Today, Kuyper is home to an enrollment of more than 250 on its Grand Rapids campus, still one of the most comprehensive Christian learning institutions among Michigan colleges. In addition to undergraduate programs in youth ministry, music and worship, and pre-seminary ministry, the university offers more than 25 majors and programs spanning subjects such as business leadership, education, and intercultural studies. Associate degrees and certificates are also available. Students may choose to explore multiple academic interests by declaring a major in interdisciplinary studies. Campus activities including retreats, holiday banquets, and community service opportunities designed to strengthen one’s call to service and faith while promoting intellectual and social skills. Founded in 1868, WSU is home to 27,000 undergraduate and graduate students. The campus’s location in the heart of Detroit allows students to easily access internships and other career opportunities. The university also operates the nation’s first electric-drive vehicle engineering program and Michigan’s largest multiple sclerosis treatment and research center. These educational resources fuel WSU’s status as one of the leading colleges in Michigan. WSU offers 126 bachelor’s degree programs, including over 50 programs in engineering and computer science. Other degrees include nursing, business administration, and psychology. Students who are unsure of their major can choose an exploratory track, which allows them to complete general education requirements while they consider which field of study to pursue. To apply, students must submit SAT or ACT scores, transcripts, and an application fee. Transfer students should have at least a 2.5 GPA and 24 credits from previous institutions. Classes typically begin in August, January, May, and June. Founded in 1883 by Patrick Roger Cleary as a school for educators, Cleary University focused on penmanship as one of the era’s most valuable professional skills. Cleary was the first independent Michigan college in the county of Washtenaw. In addition to its main campus in Howell, the university operates three education centers throughout Michigan in Ann Arbor, Detroit, and Flint. Cleary offers a bachelor of business administration (BBA) in 13 concentrations. Professional certificates and non-degree programs are also available. The school offers unique supplemental programs through its Center for Innovation and Entrepreneurship, an on-campus facility that hosts workshops and special events for undergraduate business students. The Cleary Global Entrepreneurship Bootcamp is especially popular among entrepreneurship majors in the BBA program. The Cleary campus is home to the Arthur Secunda Museum, Clancy’s Cafe, and a Spirit Shop selling CU athletic gear. Located in Kalamazoo, WMU educates more than 23,000 students. The university maintains online and lifelong learning offices in several other locations in Michigan, including Auburn Hills, Grand Rapids, and Lansing. WMU students can choose from 149 degree programs, including jazz studies, integrated supply management, sales and business marketing, and audiology. WMU is also home to the world’s oldest and largest blindness and low vision studies program. The university offers several accelerated programs which allow undergraduate students to enroll in graduate classes. To make it easy for students to transfer credits, WMU maintains articulation agreements with all 28 of Michigan’s community colleges. Freshmen applicants must submit transcripts and ACT or SAT scores. Transfer students with less than 26 prior credits must submit high school transcripts or SAT or ACT scores. WMU does not require applicants to submit letters of recommendation, personal statements, or resumes. LSSU is located in the small town of Sault Sainte Marie, which shares a border with Ontario, Canada. LSSU was the first college in the country to offer a fire science program, and the university’s aquatic research laboratory is home to one of North America’s only fisheries. With only 2,100 undergraduate students enrolled, 75% of the university’s classes have less than 30 students. Approximately 90% of students receive financial aid, making LSSU one of the most affordable colleges in Michigan. LSSU offers more than 40 degree programs, including geology, nursing, parks and recreation, manufacturing engineering technology, fish health, and fisheries and wildlife management. The school’s liberal arts/undecided program allows students to explore multiple career options while fulfilling basic education requirements. Semesters begin in the fall and spring, and summer sessions begin in May, June, and July. Incoming freshmen must have a minimum 2.4 GPA, while transfer students must have a minimum 2.0 GPA. Alma is a private liberal arts college with an average class size of 18 students. In order to best serve its 1,450 undergraduates, Alma guarantees that students can complete a 136-credit degree program in four years; if students who follow the prescribed path still need more time, Alma pays for an additional term so they can finish. Alma celebrates its Scottish heritage through its large Highland arts program, which offers Scottish arts scholarships, hosts an annual Highland festival, and sponsors dancing and bagpiping programs. Alma offers 50 academic programs, including pre-law and several pre-medicine tracks. Over 90% of students participate in at least one service learning course. In order to maintain its reputation as one of the leading schools in Michigan, Alma also promises every student up to $2,500 to support them in pursuing experiential learning opportunities such as studying abroad or participating in internships and research fellowships. As a result, 97% of Alma’s students engage in experiential learning. Northwood University-Michigan was founded in 1959 as the brainchild of Dr. Arthur E. Turner and Dr. R. Gary Stauffer, who were inspired by early space exploration and global interest in burgeoning technologies to develop a signature educational model in the tradition of the American free-enterprise society. The university maintains a residential campus on 434 acres in Midland, as well as adult learning centers and satellite locations across the state of Michigan and throughout Kentucky, Texas, Louisiana, and California. The university stands out among colleges in Michigan for offering more than 20 undergraduate programs with a focus in ethics-driven business, management, and entrepreneurship. A four-year combined BBA/MBA, adult learning programs, and graduate degrees are also available. Students may declare a dual major; unique specialized business majors include aftermarket management, fashion marketing and management, and innovation marketing and management. Student activities include student-run broadcast media outlets and community outreach opportunities organized through the EXCEL Program. Located in Grand Rapids, CU is a Christian university with around 1,250 undergraduate students. The school originated as an evening Bible institute in 1941. Today, CU is known for its theological seminaries on the main campus and in Thailand. The school is also well-regarded for its undergraduate academic programs. CU offers 104 degrees, including over 60 undergraduate majors. There are 12 accelerated programs that students can complete within three years. Students at this college can major in topics such as biblical studies, engineering, missions aviation, ministry, and worship arts. CU’s Terra Firma program places freshman in small cohorts led by a faculty mentor to support them as they transition into college. Applicants to CU should submit an essay on their Christian beliefs and SAT or ACT scores. First-time students must also have at least a 2.5 GPA. Transfer students should have a minimum 2.0 GPA. SAU’s main campus spans over 100 acres in Spring Arbor, a scenic town nestled in south Central Michigan. The school offers more than 70 undergraduate majors, four graduate programs, and several adult and professional programs to students on its main campus. SAU’s extensive list of undergraduate degrees includes bachelor’s programs in actuarial science, graphic design, piano pedagogy, youth ministry, and more. Students pursuing advanced degrees can complete an MA in counseling, an MA in education, an MBA, or an MSW at SAU’s main campus as well. Several degree completion programs are available to students finishing their associate or bachelor’s degree, and the school offers special program benefits for military students. As a Christian school, campus life at SAU focuses on spiritual growth. On-campus activities include chapel, fellowship group, outreach ministries, and over 50 clubs and organizations. Students at NMC can choose from over 80 areas of study while completing associate degrees, bachelor’s degrees in maritime and marine technology, and professional certificates. The school boasts an average class size of 20 students, meaning learners receive personalized attention from experienced faculty at its scenic campus in Traverse City. Undergrad students can earn associate degrees in several fields, including freshwater studies, manufacturing technology, renewable energy technology, and more. Bachelor’s students on campus can complete BS degrees in either maritime technology or marine technology. Several other bachelor’s programs and a selection of master’s programs are offered through NMC University Center partners. The school offers free events and activities for students, personal counseling, assistance with creating new student groups, and more, making this one of the best Michigan colleges for students looking to get involved on campus. Among enrollees in Michigan's public colleges, students come from all backgrounds. While many plan to pursue a four-year degree, others seek an associate degree or trade school certification. Campuses include traditional junior colleges and technical schools, and attendance costs at Michigan's two-year schools are higher than the national average. Still, those who complete an associate's degree are rewarded with average salaries that outpace the earnings of workers who didn't complete any college. Below, we've listed the top two-year schools in the state of Michigan. If you're thinking about applying to one of the best colleges in Michigan, continuing reading to learn more about living in the Wolverine State. Nicknamed the Great Lakes State, Michigan covers 57,022 square miles, including 16,439 square miles in the Upper Peninsula. Water enthusiasts love Michigan for its 3,126 miles of Great Lakes shoreline and 11,000 inland lakes. Wherever you are in the state, you won't be more than 85 miles from one of the Great Lakes. Tourists and residents alike flock to the state's many natural attractions: Mackinac Bridge, the world's longest suspension bridge, and Mackinac Island, a car-free zone bustling with tourists, are just two of the many popular destinations in Michigan. Despite the many attractions, the cost of living in Michigan's major cities is actually lower than in most places. Elite academic institutions and a low cost of living make Michigan an attractive place for college students. Michigan offers diverse landscapes and experiences. The Upper Peninsula is vastly different from the rest of the state, and each region of the lower peninsula offers its own distinct traits. Below, you'll find a breakdown of the major regions in Michigan, presenting an overview of life throughout the state. Establishing residency allows students to access in-state tuition at public colleges and universities in Michigan. Students 18 or older must provide proof of state residency; minors have to live with either a parent or legal guardian to qualify for in-state tuition. Minors must prove that their guardians live in the state to claim residency themselves. To establish Michigan residency, a minor must reside with a parent or guardian within the state's boundaries. If the parents are divorced or separated, the minor must live with a parent in Michigan. Minors must provide evidence that they lived with their parent in Michigan before turning 18 and prove their intention to continue living with that parent until they begin school. You must live in Michigan for at least one year prior to declaring residence. You must prove intent to make Michigan your home. Some schools grant in-state tuition to out-of-state students if one of their parents is an alumnus. Residents of Michigan can take advantage of the Midwest Student Exchange Program. This allows Michigan residents to attend select public colleges and universities in eight midwestern states while paying no more than 150% of the in-state tuition rate.